1. 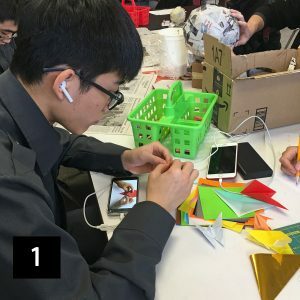 Cadet Edison Zhang is working on origami from YouTube tutorials. 2. 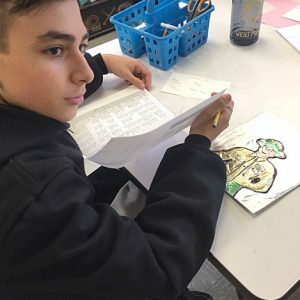 Cadet Mike Zhang sketches ideas for his paper-cut relief sculpture. 3. 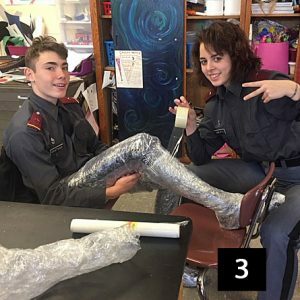 Cadets Kratman and Vinerte tackle a packing tape sculpture of a person using Kratman as a live model. 4a/b. 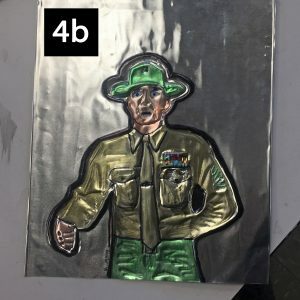 Cadet Danilov created an embossed metal sculpture as a tribute to R. Lee Ermey from a scene in Full Metal Jacket. 5. 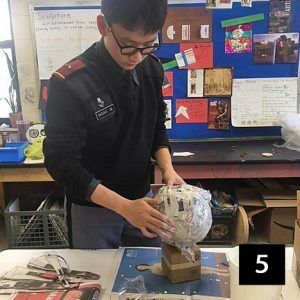 Cadet Wang is creating a paper mâché sculpture of a trophy. 6. 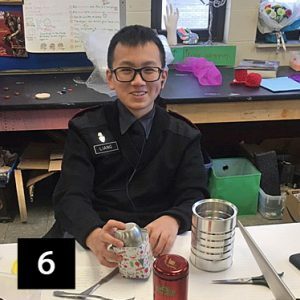 Cadet Liang is assembling a robot from found objects. 7. 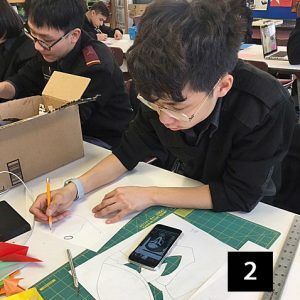 Cadet Jiang cuts newspaper to begin a design for a sculpture. 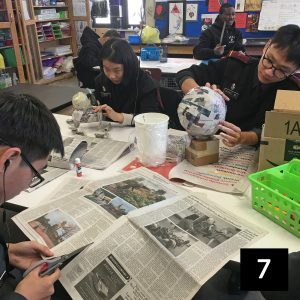 Cadets Wang and Wen work on paper mâché. 8. 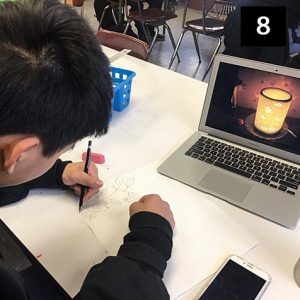 Cadet Fan designs a paper lantern. 9. 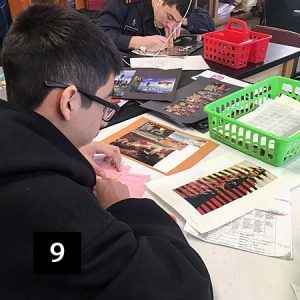 Cadet Hernandez reflects on another cadet’s project and offers a critique of their work. 10. 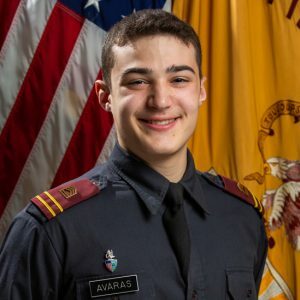 Cadet Avaras tackles metal tooling. 11. 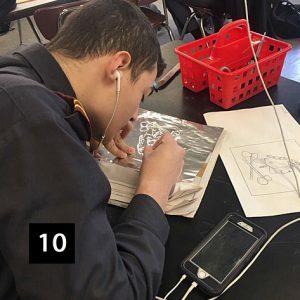 Cadet Deluccia practices with metal tooling. 12. 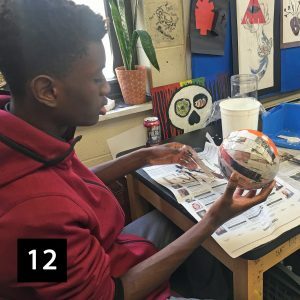 Cadet Sykes covers a balloon in paper mâché. We have been getting a lot of inquiries from prospective applicants for this year’s Summer Leadership Program at NYMA. The three 2-week sessions will be offered this summer for children who are 11 and above. 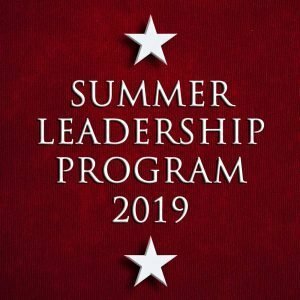 The Summer Leadership Program features leadership lessons, STEAM classes, as well as hands-on outdoor survival courses. Participants also get to practice Drill & Ceremony and a variety of sports including rifle training. 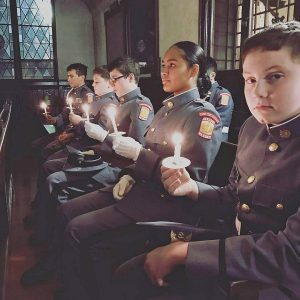 In addition to the enriched daily activities, the program provides participants with exclusive experiences such as touring the West Point campus and experiencing their Leadership Reaction Course. 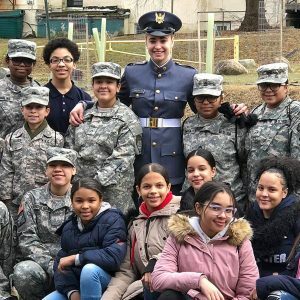 Weekend trips to New York City (at additional coast) and to local attractions are always a favorite according to students who attended past programs. 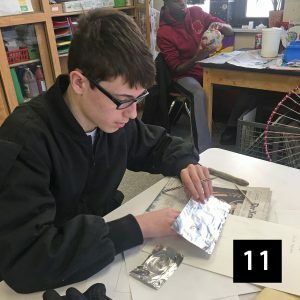 You can check out last year’s summer blog at nymasummerblog.wordpress.com/ to get a taste of all that the program offers. An early bird discount is available to students applying before April 1st. 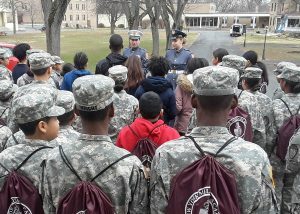 For more detailed information about the program, please visit nyma.org/programs/summer-leadership-program/. If you have any questions or concerns, feel free to contact Bonnie Dong, Summer Program Coordinator, at bdong@nyma.org. 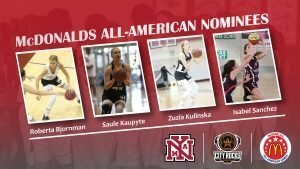 Congratulations to Cadets Roberta Bjornman, Saule Kaupyte, Zuzanna Kulinska, and Isabel Sanchez on their McDonald’s All-American nominations for this year. 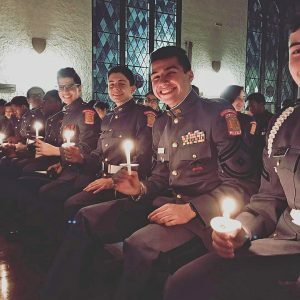 Great job cadets! They had a great time visiting and learning more about our school and campus. 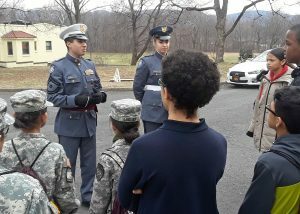 Many thanks to SM Montes and Cadet Kaupyte for being great hosts! 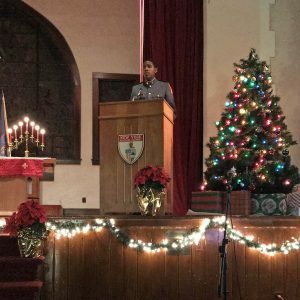 On Sunday, 1/6, while many of the cadets were moving back into their dorms, the NYMA Boys Varsity Basketball team was down in Baltimore, MD and it was not for the Ravens playoff game. They were in town to renew a historic athletic rivalry with Admiral Farragut from St. Petersburg, Florida (formerly from New Jersey). The game was played at the famous Under Armor House in Baltimore which was formerly the Carmelo Anthony Gym. It was truly a test of two heavyweights as the “Little Army/Navy Game” rivalry was restored. Admiral Farragut struck first but NYMA responded with a 3-point field goal from Josh Antoine. Just like two heavyweights, the two teams traded baskets and continued to feel each other out. Admiral Farragut went into the half with a five point lead, but the Knights came out in the third quarter looking to take over. It was a great game…up and down, back and forth action for all four quarters. In the end the Knights would eventually fall by the score of 60-67. Admiral Farragut would bring home the coveted Founder’s Cup Trophy which was donated by NYMA Alum Joseph Mele. 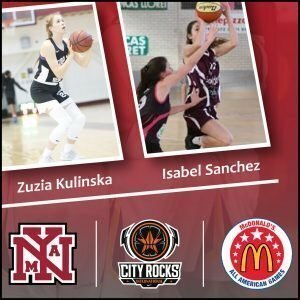 Zamere McKenzie led NYMA in scoring with 19 points. This was the Knights’ first loss of the season as they drop to 4-1 overall. However, it was an amazing game that showed great sportsmanship and respect between two schools that have a rich tradition of competition. There were many alumni on hand for both schools. After the game the two teams went out to lunch together and had a chance to talk with some of the alumni before heading back to campus. Now that the cadets have settled back in, winter athletics are in full-swing. 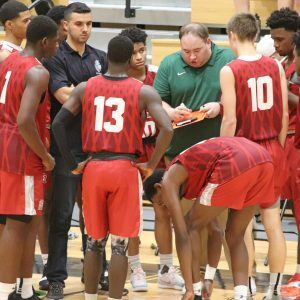 Tonight our Cheerleaders, Boys JV, Boys Varsity, and Girls Varsity Basketball teams will all head to Marvelwood for a triple-header which should make for a fun night. On Saturday the three teams are in action again as they are all at home. Boys JV Basketball will take on Woodstock at 1:00 pm. Girls and Boys Varsity Basketball will have a HVAL double-header versus Darrow. The girls will play first at 2:30 pm and the boys game will follow at 4:00 pm. The Knights Varsity Wrestling team is also in action on Saturday as they head to Loomis Chaffe. When did you come to NYMA? I came to NYMA on August 21, 2017. What was your expectation before arriving? Was it different than what you expected? 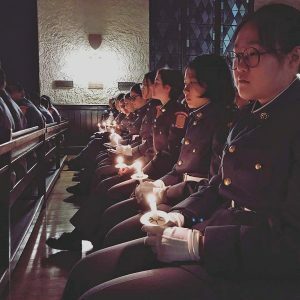 My expectation was that it would be exactly like the military. Instead, we had a balance of academics and a military-based lifestyle. I thought everyone would be very strict but instead, I found that order and structure was attained if you did what was expected of you to the best of your ability. How has NYMA helped shape who you’ve become today? Are there any mentors that have impacted you during your time here? NYMA provided me with structure and taught me time management skills. I learned what it truly means to be a leader and to be responsible – for myself and others. 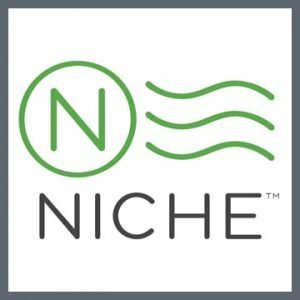 I learned how to represent myself well, how to act professionally, and how to communicate effectively. My biggest mentors in life are my family. They are my role models and a lot of what I have learned in life has come from them. I wouldn’t be where I am without them. 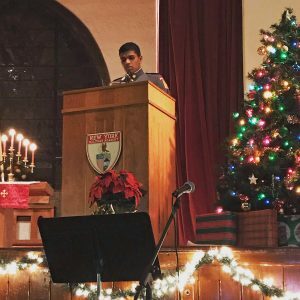 At NYMA, my biggest role model was First Captain Nigel Petti-Fernandez ‘18. He was a Lieutenant Colonel the first year I attended NYMA. 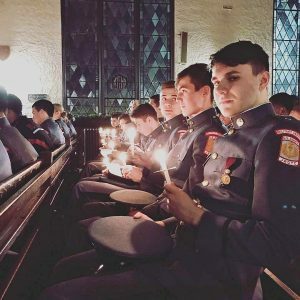 I’ve never seen better leadership among the corps. I plan on going to college, enlisting in the Navy, and becoming a SEAL. 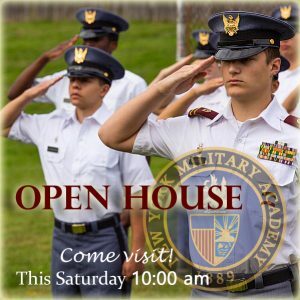 Open Houses begin at 10:00 am and end at approximately 1:00 pm. 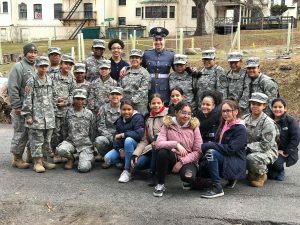 Families will then join in an informal meet and greet with the Academy’s staff, enjoy a brief presentation, and be shown around campus by the cadets. Interviews of prospective cadets will be conducted throughout the day. Please contact the Admissions Office to RSVP at admissions@nyma.org or 845-534-3710, Ext. 4272. Thank you! 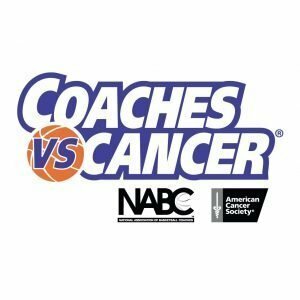 The New England Recruiting Report is teaming up with Coaches vs. Cancer to coordinate fundraisers with schools in hopes of raising $25,000 for the American Cancer Society. NYMA will be participating and hosting a fundraiser at Alumni Gym on January 26th during the Boys Varsity Basketball game against Springfield Commonwealth at 3:30 pm. Hope to see you there! To contribute to NYMA’s fundraiser, please click here. 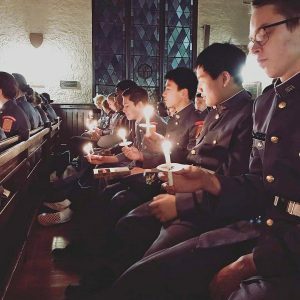 The Interfaith Candlelight Service is a traditional NYMA event that dates back more than a hundred years and brings the Corps of Cadets, faculty and staff, and parents together to mark the holidays in a way that celebrates the diversity on our campus.